In this year's first 6 months 73 cops were killed, a 12% bump from last year. When New York State Police trooper Nicholas Clark responded to a reported suicidal person barricaded in a home this month, the suspect gunned him down before taking his own life. "A 29-year-old trooper, a stellar trooper with an extraordinary record, his whole life before him," a grieving New York Gov. Andrew Cuomo said at a news conference hours later. "Great athlete. Well accomplished. He wanted to do one thing -- which was help people." Clark was not alone. His death followed those of over 70 brothers and sisters in blue across the country already this year. 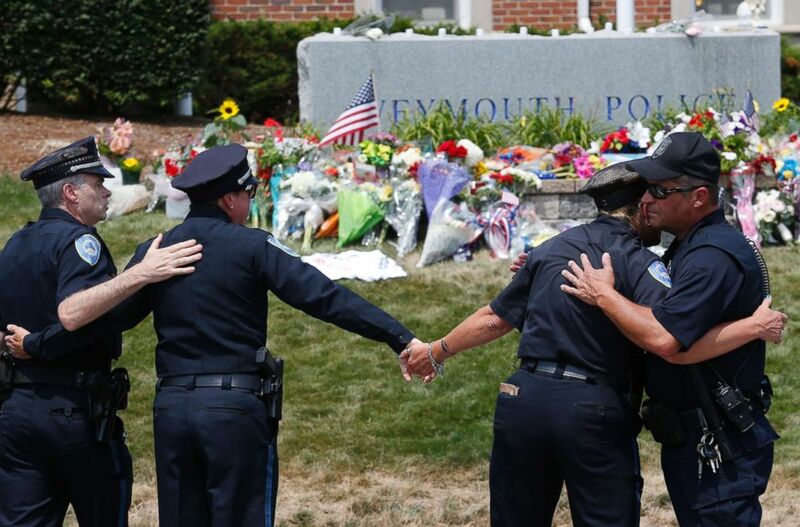 (Jessica Rinaldi/The Boston Globe via Getty Images) Weymouth Police officers embrace after the procession for slain Weymouth Police officer Michael Chesna, 42, passed by the Weymouth Police station in Weymouth, Mass., July 16, 2018. 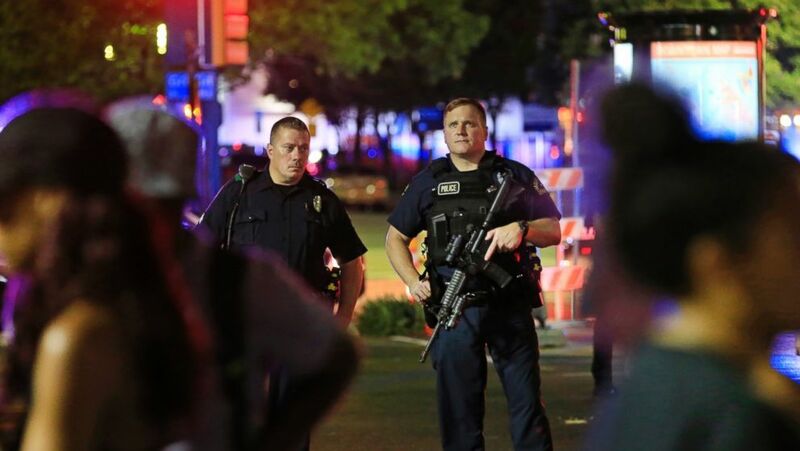 Gunfire was the leading cause of death among the 73 officers killed in the first half of the year, accounting for 42 percent of the deaths, according to the memorial fund. What’s more, of the 129 total deaths last year, the number involving guns equaled the number of officers who died in work-related traffic incidents, which usually account for more deaths, the organization said. The overall increase continued in that direction for the first half of this year, when 31 officers died in gun-related incidents, compared with 25 in the same period last year, a 24 percent jump for the six-month period, the National Law Enforcement Officers Memorial Fund said. Eight of this year's 31 gun deaths resulted from an arrest attempt; six officers died responding to a domestic disturbance; and three officers died in an ambush, the memorial fund said. 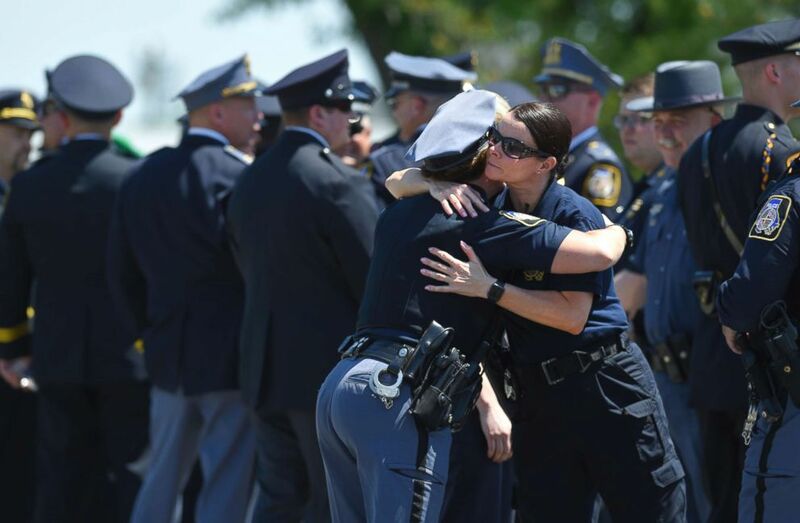 (Lloyd Fox/The Baltimore Sun via AP) Police officers console one another while waiting to get into the viewing for slain Baltimore County police officer Amy Caprio in Nottingham, Md., May 24, 2018. Caprio died Monday after she was run over by a Jeep while investigating a burglary at a house in Perry Hall, Md. "I think what you're starting to see is some of these suspects committing their crimes with much more impunity than they have," ABC News contributor and former Dallas police chief David Brown said. "And officers are continuing to be, I think, a little more cautious in the way that they interact with these folks, trying to wait for cover, trying to give a little bit more time and distance. "That's a significant change in the dynamic of officer safety," he added. "And this becomes a psychological thing for cops when they experience it on their beat or when they hear about the data of more aggression towards cops by armed suspects." 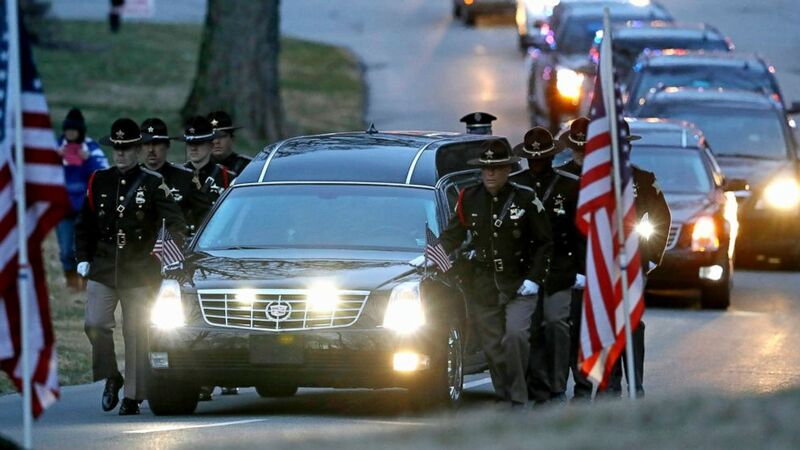 (Darron Cummings/AP, FILE) The honor guard walks along the hearse carrying the casket of Boone County Sheriff's Deputy Jacob Pickett, March 9, 2018, in Indianapolis. Facing an armed suspect's aggression is something Brown knows all too well. Five law enforcement officers were gunned down by a sniper in Dallas in July 2016 -- the deadliest day for U.S. law enforcement since 9/11. Brown, who was the police chief at the time of the attack, retired several months later after 33 years with the department. (Ron Jenkins/Getty Images) Dallas police and residents stand near the scene where Dallas police officers were shot and killed on July 7, 2016 in Dallas, Texas. 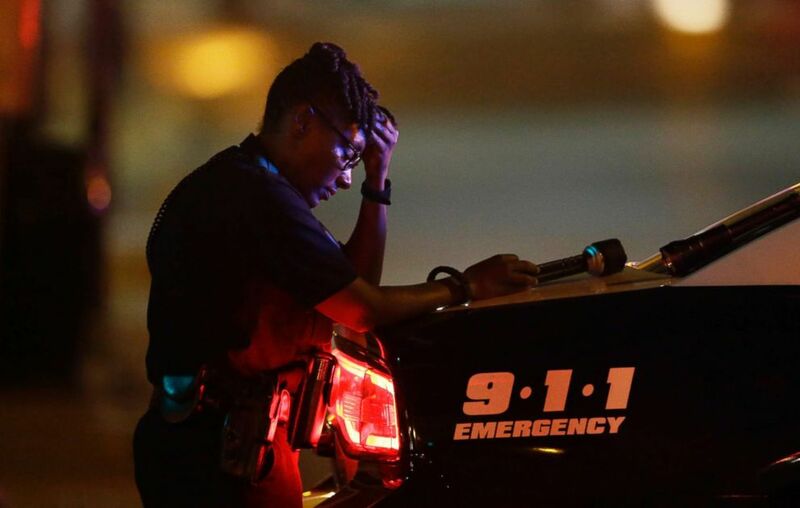 (LM Otero/AP, FILE) A Dallas police officer, takes a moment as she guards an intersection after a shooting in downtown Dallas, July 8, 2016. As with Dallas this time two years ago, police agencies across the country, from Maine to Florida to California, have mourned fallen colleagues this year. And the deaths go beyond shootings. Out of the 73 officers killed in the line of duty from January to June, 27 died from traffic-related incidents, while 15 died from other causes, like job-related illnesses, the fund said. Of the 15 who died from other causes, six of the officers died as a result of an illness from 9/11, the fund said. 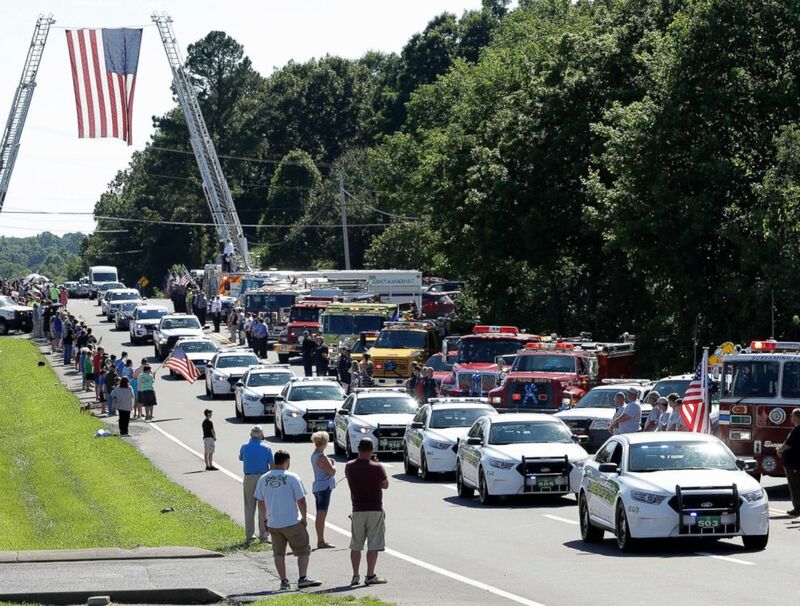 (Mark Humphrey/AP) Patrol cars of the Dickson County Sheriff's Office pass through Dickson, Tenn., during the funeral procession for Dickson County Sgt. Daniel Baker, June 5, 2018. Baker was found dead in his patrol car May 30 after responding to a call about a suspicious vehicle. "A lot of officers patrol and work in pairs, so you spend a lot of time with your immediate co-workers,” Steve Groeninger, spokesman for the National Law Enforcement Officers Memorial Fund, told ABC News. “So for one of them to be killed in the line of duty, it does have a big impact on any department that loses an officer. "For smaller departments and agencies it has even a greater impact," he continued, "because not only are you trying to help your patrol cope with the loss of life and you're trying to help that family who lost their loved one and process the tragedy, but then as the department head -- especially in a small department -- you've lost a significant amount of your workforce." 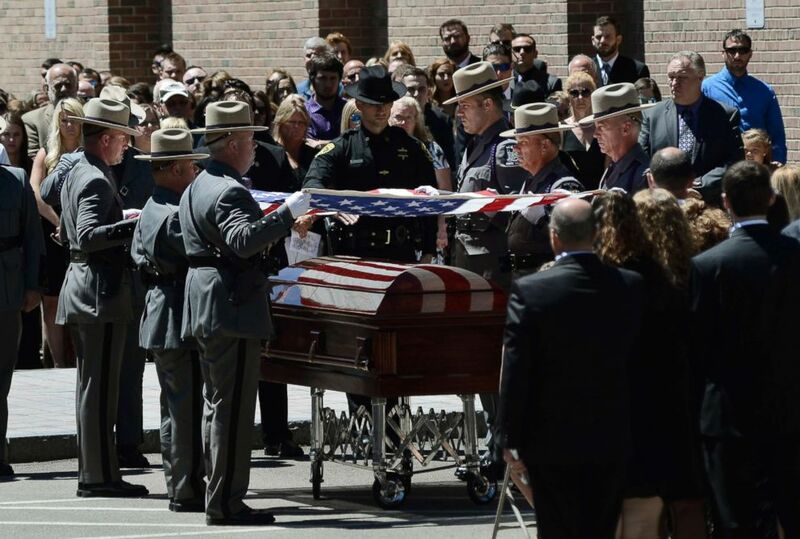 (Heather Ainsworth/AP) The honor guard lifts the flag off of Trooper Nicholas Clark's casket, which was folded and presented to Clark's family during the funeral service for Clark, July 8, 2018 at Alfred University in Alfred, N.Y. Clark, 29, was shot and killed July 2 while responding to a suicidal individual in the Corning, N.Y., area. Groeninger stressed, "While we're throwing around a lot of numbers and percentages, we all must be mindful as a nation that these 73 officers represent 73 shattered families, 73 shattered police departments or agencies, and I would have to guess, 73 upstanding citizens no longer a part of these communities." On average, the 73 slain officers in the first half of the year each left behind two children, according to the memorial fund. 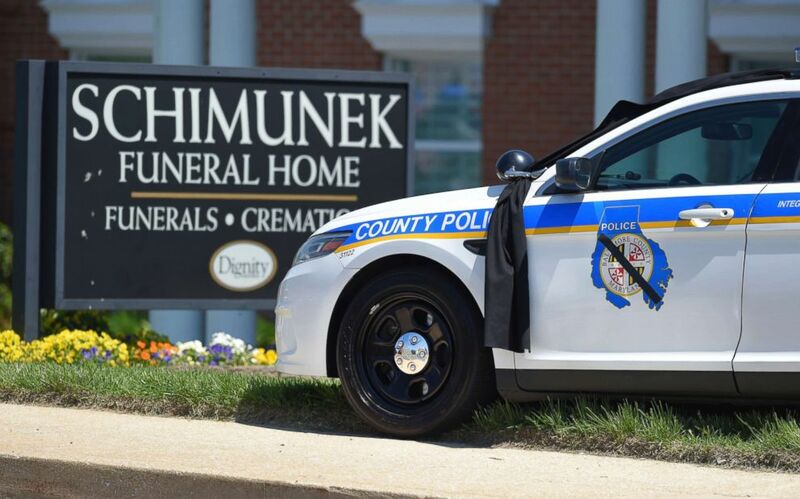 (Lloyd Fox/The Baltimore Sun via AP) A Baltimore County police car draped in black is parked outside the Schimunek Funeral Home for the viewing of slain Baltimore County police officer Amy Caprio in Nottingham, Md., May 24, 2018. "We're talking about loss of life," he said. "It goes far deeper than numbers and percentages." Hours after state trooper Clark's July 2 death, New York Gov. Cuomo said, “This is one situation that I've gone through before. There's no answer. There's no point. It's just sad and painful." Every day is dangerous for police, Cuomo said, from domestic violence incidents to storms to potential terrorism. "We know the danger that you put yourself in every day when you leave the house," the governor said. "We know the fear that is in your families' heart when you're out there. And we truly and deeply appreciate the risk that you take to keep our families safe." 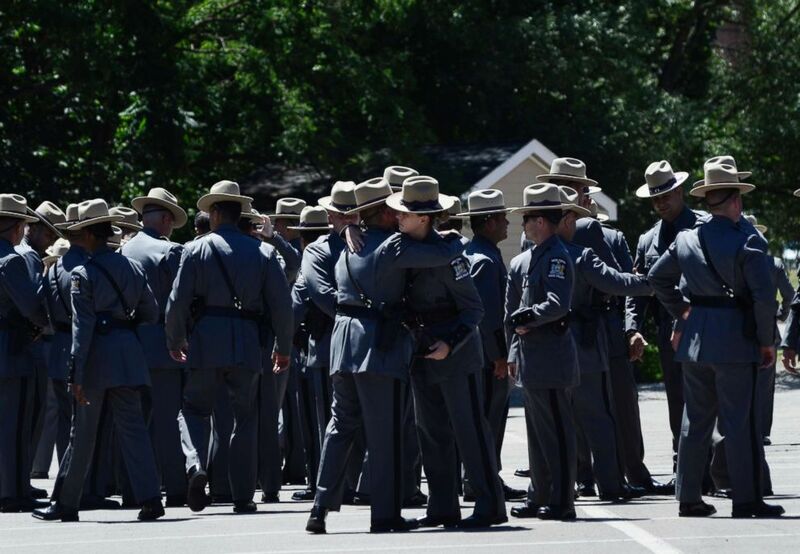 (Heather Ainsworth/AP) New York State Police Troopers embrace before leaving the funeral service for fellow Trooper Nicholas F. Clark, July 8, 2018, at Alfred University in Alfred, N.Y. Though officer deaths are on the rise this year, Brown said, "I don't believe this is sustainable. I don't think the spike will continue." "One officer killed in the line of duty is one too many," Brown said. "We need them to continue their brave work and their sacrifice... and to know that people support them when they're doing the job the right way. Officers also need to hear that it's extremely important, as well, that they be held accountable when they make mistakes." "Some of the bravest people you'll ever meet do this job. Every day, they don't know if they're coming home to their families. And every day, they strap up those guns and put the badges on and do great work," he said. "I pray for our cops every day. We need them to do the job in the right ways and to be safe and come home to their families."